August 16th through August 21st. 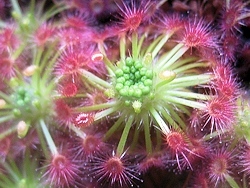 Almost all carnivorous plants can be propagated by seed. This doesn't mean that it's the most efficient method for the home grower. In many species, cuttings from leaves, stems or roots may be a preferable alternative to growing from seed, and may yield faster results as well. Plants grown from seed often take longer to reach maturity than those propagated from adult plant material. That being said, one can often create a far greater number and diversity of plants by way of seed, if you're prepared for the challenge. We offer a limited selection of seeds for sale, with availability varying with the season. Pygmy Drosera gemmae are also available in the late autumn/early winter. Our current offerings are below. Please see "The Ordering Process" page for more information. The Venus Flytrap produces several white, five-petaled flowers on a tall stalk in the early spring. The stamens produce a light-yellow, grainy pollen which may be used to fertilize the flowers of neighboring flytrap plants. 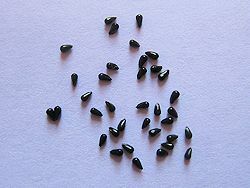 After fertilization, each fertilized flower produces a cluster of smooth, black seeds which may be sown directly on media, without need of a cold stratification. We currently offer seeds from the prolific Cape Sundew, Drosera capensis, which sets seeds very, very readily through its self-pollinating flowers, which emerge from a long, unfurling stalk. 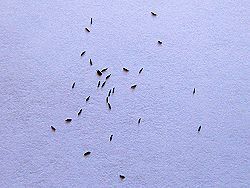 Seeds must be germinated under warm, humid conditions. 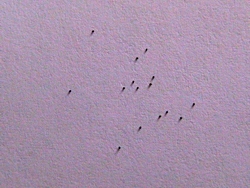 The diminutive Pygmy sundews of Australia reproduce by two methods. One method is by seed. Several species are self-compatible and produce viable seed, which can be sown and germinated under warm, humid conditions. The tiny pygmy sundews of southwestern Australia are beautiful little plants that produce rosettes of carnivorous leaves like their larger non-pygmy cousins, but also will produce clusters of tiny seedlike modified leaves called "gemmae" in the winter. These gemmae, pop off of the plant when touched and can form a clone of the mother plant wherever it lands. This is, by and large, the easiest and preferred method of growing pygmy sundews. However, because gemmae are only produced in the late autumn/early winter, their availability is strictly seasonal.